A simple instantly working Mass Vashikaran Tantra in which a little bit of Akarshan Mantra Infused Oil is applied on the face in order to attract and get the co-operation of other people who are attending any kind of meeting or a gathering has been described in this post. This Mantra, which is from the Jain Tantra is said to enable the practitioner to bind an entire gathering under his Vashikaran Spell. The term gathering of people in the context of this Tel Se Sabka Akarshan Karne Ka Prayog includes meetings of all kinds, including those meetings connected to a marriage proposal, a finance related meeting, a gathering in a court or any legal or political gathering, conferences related to business or the workplace or any other gathering of people. The 3 simple steps should be followed in order to cast this Akarshan Spell on more than one persons. 1] Take a little bit of oil in your right palm and chant the Akarshan Mantra given below 21 times in order to transfer the vibration of the Mantra into the oil. 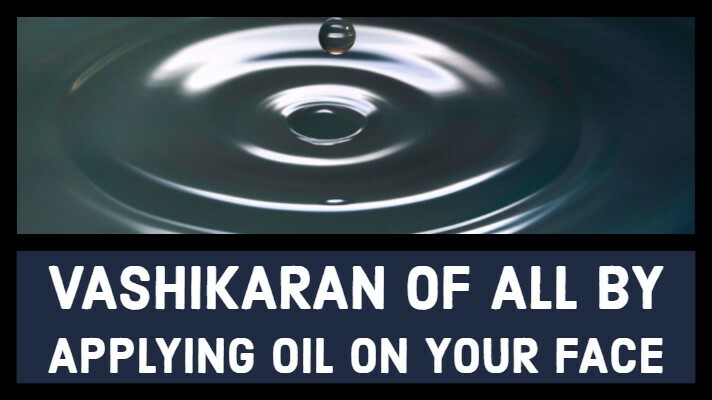 Any kind of oil that is normally used for applying on the body can be used for this Akarshan Prayog. 2] Then, apply that Mantra Infused Oil on your face. 3] Then, straight away go the meeting, gathering, conference summit, court or any other place where you wish to cast an Akarshan Spell on the audience or other people who are attending the gathering. Note- There are no rituals or any other Vidhi connected to this Attraction By Oil Mantra Experiment and it can be practiced on any day. As this Mantra has originated from the Jain Religion, it will not help the practitioner in the fulfillment of Tamsik or destructive purpose or for harming other people against their wishes. Can the oil be replaced with any face cream? Only a very small quantity of oil should be used for this Totka.